Retailers worldwide are all looking for ways to create the perfect store experience and reduce operating expenses at the same time. This is why, a LED-based lighting system is the right answer to their challenges. LED lighting systems allow retailers to tailor lighting to a certain moment of the day, to a day of the week and even according to the type of merchandise through special colors, all the while accruing significant savings due to this technology low energy consumption and long lifetime. As today's shoppers become more demanding and sophisticated, retailers are looking for innovative ways to offer customers an easy and unforgettable shopping experience. The shopping journey starts to integrate sensors and create lighting scenarios that allow them to impress and retain customers in the store for a longer period of time. In a typical fashion store, the desired atmosphere can be created with the right type of light that arouses our emotions. This way, the store lighting serves as a guide that leads customers throughout their shopping experience. Firstly, the perfect light stimulates the shoppers to spend more time in the store and this will increase sales prospects. Secondly, contrast in lighting is used for a better focus of the buyers' attention. Flattering light that enhances their skin tone and the fabrics will make shoppers look amazing in the fitting rooms and will entice them to buy. Furthermore, a high CRI renders the true colors and textures and helps the customer evaluate the product properly, as if in natural sunlight. It also contributes to showing-off the merchandise honestly. No cheating, no color manipulation, just true colors. CRI 90 to 100 is the best color rendering for retail shops. While CRI reproduces how "natural" an object appears, GAI measures how "vivid" the colors appear. GAI (Gamut Area Index) is a metric derived from the spectral power distribution of a light source. Typically, GAI targets the separation of the colors in an illuminated object. Of course, the greater the separation among the selected points, the better the discrimination among hues under that source of illumination. Lastly, lighting effects are very different depending on the type of the fashion shop. The right light determines a certain mood. For example, high illuminance is used for high street shopping where customers have to decide fast and purchase right away, and low illuminance with a dramatic lighting effect is recommended for exclusive stores where shoppers should feel pampered. For babies and children fashion stores, it would be more appropriate to use soft, diffuse lighting that has a clean and pure effect. Get more inspiration from a fashion retail study case, here. A flexible store concept has to be prepared for the frequent changes of the products on display. Therefore, the frequent changes of gondolas and shelves make various demands on a lighting concept. The best part of using a track lighting system is that it can be aimed directly a the display area - focusing people’s attention on the merchandise. Of course, the most convenient lighting systems are adaptable ones, according to the brand personality and the store design. For a flexible LED lighting system, track-mounted spotlights and downlights are the most suitable ones. They focus the light beam precisely on the products that need to be lightened. Remember to always focus the light beam onto the merchandise from the viewer’s point of view. Improper use of track lights may cause glare, and this is a big problem in retail lighting. The track system is famous for its fast and flexible installation. Moreover, aiming the spotlights in the right directions guarantees adaptability and meets various requirements of the store. Plus, a light designer can help you choose the right beam distribution for you fashion store and introduce you the ultimate special colors for this type of retail business. According to the needs, you can choose from a standard three-phase track with DALI line track, or a track that is suitable for more architectural spaces, the Dyad track. The latest-generation LED spotlights ensure brilliant light for exposing the goods as naturally as possible. For this purpose, Greentek developed FAS, a special color with an excellent 95 color rendering index which saturates and enriches a wide color range. FAS special color also emits zero UV rays. This way, the fashion items benefit from an enhanced color effect and extra protection against discoloring. Read more about setting the perfect lighting in a fashion store, here. Light emitting diodes (LED) are at their core, just semiconductors. As a result, LED are a native environment for digitalization of light which means you can now personalize your lighting system in order to achieve significant energy savings, increase sales and foster better well-being for your costumers. It has become possible to control the lights, dim them, create lighting scenarios and optimize the energy consumption with just a simple app, all without cabling, control pannels or wall switches. That's pretty amazing, isn't it? In addition, smart lighting systems allow you to change the color temperature from cool to warm light and every shade in-between. 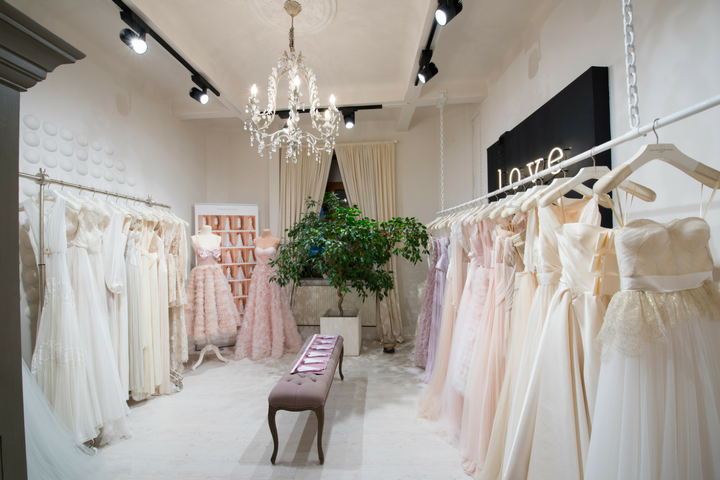 We advice you to select a cool light for high-street stores and a warmer light for premium retail or mix light color according to seasonal collections. There are a host of applications on the market for light control, you just have to try and decide which one is best for your store and existing luminaires. Considering all the benefits of a LED lighting system, it gets so easy to control the efficiency and effectiveness of your lighting systems. LED will help you reduce costs and improve your store looking with a brand new modern design. Choices in lighting have just become more simplified.